Min søster, Jennifer, og sin familie vil flytte til Colorado i februar fordi min svoger begynder et nyt firma i Crested Butte, en "ski by" i Rocky Bjerge. Jennifer og familien er i Crested Butte denne uge for at fejre nytårs og for at finde et nyt hus fordi de solgte deres hus i Oklahoma City på kun 5 dage! Min niece, Campbell, nyder sneen hvilket er en god ting siden bjerget har modtog 345cm af sne allerede! My sister, Jennifer, and her family are moving to Colorado in February because my brother has started a new company in Crested Butte, a "ski town" in the Rocky Mountains. Jennifer and the family are in Crested Butte this week to celebrate New Years and to find a new house because they sold their house in Oklahoma City in only 5 days! 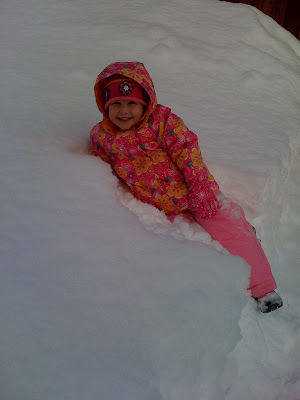 My niece, Campbell, enjoys the snow which is a good thing, since the mountain has already received 136 inches of snow this season! campbell is getting so big! maybe we can go see them in co when we visit melynee? love you guys! Holy crap! Everyone keeps moving farther and farther away from your parents!